The Schneider GGBL3020 is a 13A, single pole, 2 gang switched socket. It has a clean white appearance and can be used with a 25mm back box. 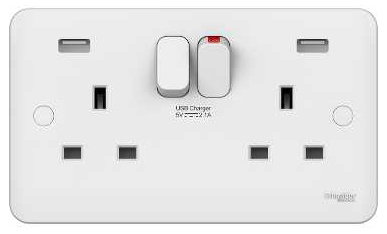 The Schneider GGBL30202USBS is a 13A, 2 gang switched socket complete with two USB ports, ideal for charging modern day mobile phones and tablets. It has a clean white appearance and can be installed in a 25mm mounting box. The Schneider GGBL3020D is a 13A, 2 gang, double pole, switched socket. It has a clean white appearance and can be installed in a 25mm mounting box. The Schneider GGBL3010 is a 13A, single pole, 1 gang switched socket. It has a clean white appearance and can be used with a 25mm back box. The Schneider GGBL3010D is a 13A, 1 gang, double pole, switched socket. It has a clean white appearance and can be installed in a 25mm mounting box. The Schneider GGBL3050 is a 13A, single pole, 1 gang unswitched socket. It has a clean white appearance and can be used with a 25mm back box. The Schneider GGBL1011 is a 10AX, 1 gang, 1 way plateswitch. It has a clean white appearance and can be installed in a 25mm mounting box. The Schneider GGBL1012 is a 10AX, 1 gang, 2 way plateswitch. It has a clean white appearance and can be installed in a 25mm mounting box. The Schneider GGBL1022 is a 10AX, 2 gang, 2 way plateswitch. It has a clean white appearance and can be installed in a 25mm mounting box. The Schneider GGBL1032 is a 10AX, 3 gang, 2 way plateswitch. It has a clean white appearance and can be installed in a 25mm mounting box. The Schneider GGBL1042 is a 10AX, 4 gang, 2 way plateswitch. It has a clean white appearance and can be installed in a 25mm mounting box. The Schneider GGBL1014 is a 10AX, 1 gang, intermediate switch. It has a clean white appearance and can be installed in a 25mm mounting box.